Apple has the iPhone; Google the Nexus line. Microsoft has a bunch of numbers that don’t mean much to anyone. It’s not that Microsoft’s Windows Phone platform is heading in the wrong direction. It’s not really headed anywhere at all. Microsoft needs to figure out what Windows Phone stands for, fast—and capitalize upon it with a flagship phone that embodies all of those features. That’s the upshot of a report on Windows Phone, released Thursday, that paints a dim picture of the future as the company embraces the midrange and low-end phones. Anemic developer support compounds the problem, the report's author added. And to a large degree, he’s right. In the report from Jan Dawson of Jackdaw Research, Dawson recommends that Microsoft continue to identify differentiating features that distinguish Windows Phone from Apple’s iOS, which dominates the high end of the market; and Android, which eats up everything else. Windows Phone appears to be attacking the same portion of the market Android is, with quality hardware at bargain prices—but with a fraction of the user base. Dawson recommends developing an iconic flagship phone, and I agree with him on that. Dawson almost implies it’s too late to save the Lumia line, in part because of the vicious circle of app development: A lack of users means less potential revenue, which means developers hold off developing apps for the platform, which turns off consumers who might be interested in the platform. Are cheap, third-party phones the way forward for Windows Phone? Maybe to build a user base, but that’s all. The report notes that Windows Phone’s market share peaked at 3.4 percent in the fourth quarter of 2013 and has declined ever since. In part, that’s because shipments have remained flat at about 34 million units for the last year. So what needs to be done? Here’s the problem and some solutions. Unfortunately, it’s hard not to come away from the report without feeling that Windows Phone represents the Walmart of the smartphone market. The cheapest Windows Phones—the 500 series—represent about 40 percent of the Lumias in the market today, according to AdDuplex. For the past 24 months, the Lumia 520 was by far the most popular Windows Phone device, outselling the next most popular model (the Lumia 625) by almost double, data from Counterpoint Research shows. And that’s not surprising, because the 520 costs about $30 on Amazon, or $80 unlocked. Unfortunately, Google has been making similar pushes into the low-end Android space, with phones like the Moto G and Moto E providing quality hardware at inexpensive prices. That, in turn, has put additional pressure on Windows Phone, due to the lack of quality apps. Dawson spends considerable time detailing the “app gap” between Windows Phone, iOS, and Android. 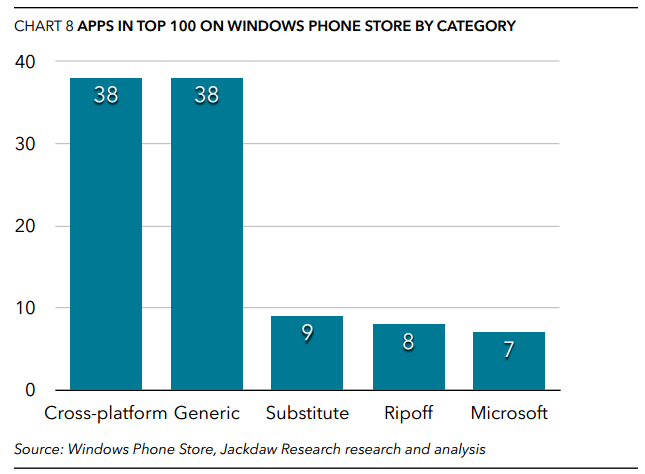 But the most damning graphic is the one below: Over half of the most popular apps in the Windows Phone Store are ‘generic’ (random apps that fulfill minor functions), ‘substitute’ (app developed to fill in for a name-brand app that isn’t in the Store), or ‘ripoff’ (Dawson’s wording is self-explanatory). Of the top 100 free apps within the Windows Phone Store, most aren’t even from the original developer. 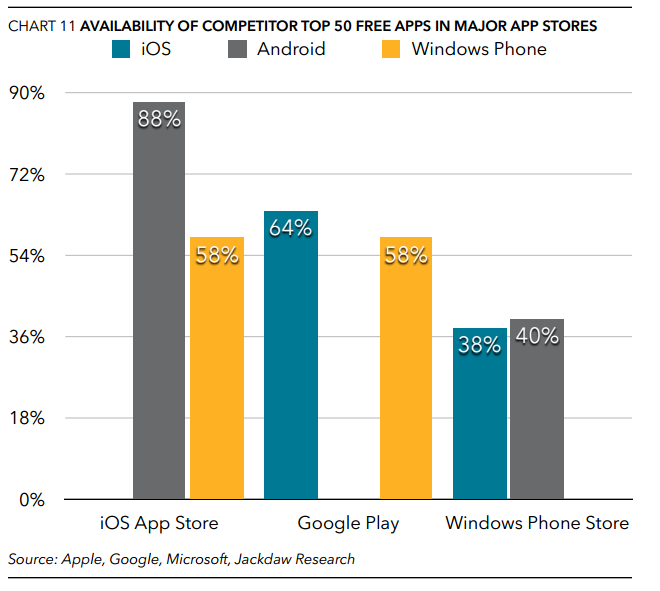 We all knew this next finding, but when you see it in a chart it’s more stark: iOS users can find pretty much all of the best and brightest apps on their platform. Windows Phone users are far less fortunate. This somewhat complex graphic shows that most apps are available on Android and iOS, but not on Windows Phone. As I see it, Windows Phone is essentially the Nintendo of the smartphone world. Like Nintendo’s Mario, Zelda, and Donkey Kong games, Microsoft’s Windows Phone platform was built around a few core technologies: Office and Skype. Porting Microsoft’s software and services to other platforms—such as Office to Android or iOS—has increased their value and extended their lifespans, Dawson notes, but it also severely undermines the value Microsoft can bring to its own hardware. The solution: What is Windows Phone? Dawson lays out a three-point solution for Microsoft: Find a better way to appeal to developers. Design and showcase a flagship phone. Focus on what makes Windows Phone special. The 'special' part is the rub: Microsoft hasn’t yet defined what Windows Phone is. Microsoft’s Surface tablet had the same struggle initially, but since Microsoft tied it to the company’s productivity message, the Surface has begun to take off. Microsoft’s tried the same tack with Windows Phone to some extent, but the strategy hasn’t really succeeded—in part, because a phone is as much a personal entertainment device as a productivity tool. Windows Phone still operates in some sort of nebulous space where it provides solid hardware for less. But that’s a tough sell. Let’s leave the “app gap” aside—Microsoft can only do so much to attract developer attention. But otherwise, it controls its own fate. What it can do to improve? 1. Underscore the basics. 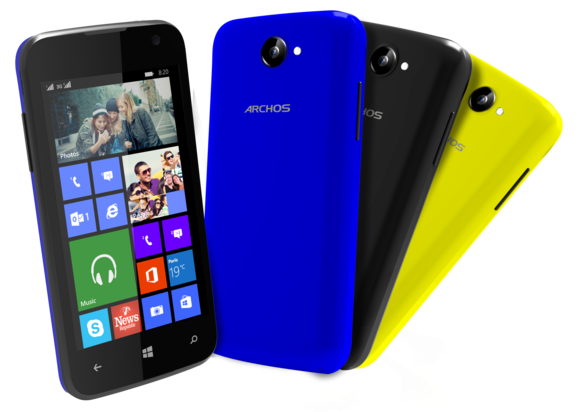 Windows Phones do what you expect a smartphone to do, as well or better than the competition. They include solid hardware, excellent cameras, tight integration with Outlook and other email, a good digital assistant in Cortana, and fundamental social apps like Twitter and Facebook. Even inexpensive Windows Phones generally run pretty well, and OS fragmentation is relatively nonexistent: Virtually every Windows Phone is powered by WP8 or 8.1. Here’s your tagline, Microsoft: The Lumia is the best smartphone you can buy afford. 2. Free the flexibility. Anyone who’s used multiple Windows Phones, however, knows that over time there’s a disappointing sameness about them. That’s the flip side of familiarity: If you buy a new Windows Phone, chances are you’ll be able to clone over your familiar apps and data onto a new candy-colored phone that looks very similar to your older phone. Microsoft’s Windows Phone OS felt fresh when it first shipped, but now it’s time to see what others can do. Say what you will about Samsung TouchWiz and HTC’s Sense: Android allows a framework for OEMs to differentiate and experiment, adding loyal fans in the process. Microsoft doesn’t. And with virtually every Windows Phone (save for HTC’s One (M8)) made by Microsoft, there’s just not the flexibility that Android offers. Anyone can throw a fart app into the Windows Store, but you don’t allow HTC to redo the Start screen? This is backward. That’s exactly what Apple offers through generation and generation of iPhones, obviously. But with each new generation, Apple trumpets exactly why you’ll want to wait in line for the latest model. Does Microsoft? Nah. 3. Features make the flagship. There have been rumors of a Lumia with a 50-megapixel camera lurking within. I’m skeptical, too. But man, Microsoft needs something for customers to get excited about—not just unlimited OneDrive cloud storage. And if Microsoft does come up with something innovative, do we hear about it? Nope. I’m not impressed with the Lumia Selfie app, as it centers your face a bit too much in the frame for my taste. (“Yes, Mom, that’s Half Dome. Well, trust me, it’s there.”) But it accomplishes two things: First, because it shoots selfies using the larger rear camera, it eliminates the need for the 5MP selfie cameras that phones like the Lumia 735 include. Second, it’s an app that no other platform has. The Nokia Lumia Icon isn’t just a memorable phone; it has a memorable name, too. Go crazy, Microsoft. Shoot for the moon. Give every Windows Phone user who buys a Lumia 520 that shining hope that one day he’s going to buy the Lumia Zeus, that six-inch quad-HD phablet that plugs into your Xbox One and unlocks when your Microsoft Band approaches it. But if you don’t, at least try to convince the world you’re making a difference. 4. We love names. For those people who identify with their new BMW 325i, terrific. Personally, numbers have never meant a whole lot to me except as markers for a new generation of product. If bigger doesn’t mean better, it can be confusing. Names, however, project an aura of intimacy. The name doesn’t have to be warm and welcoming: we all know what someone means when they say they love their Nexus. But with Microsoft’s numeric product names, I sometimes have to think: Okay, which one is that? And because many of them look alike, I’m forced to hunt down the specs and the release date. If you read between the lines, Dawson seems to making as many arguments against Windows Phone as he is for it. But you can’t really write off a multi-billion-dollar investment as easily as you can Barnes & Noble’s Nook e-reader. As a consumer, I want more choice. But Microsoft has to want more for Windows Phone, too.